Now I am back on my iPad’s on-screen virtual keyboard. Much better. 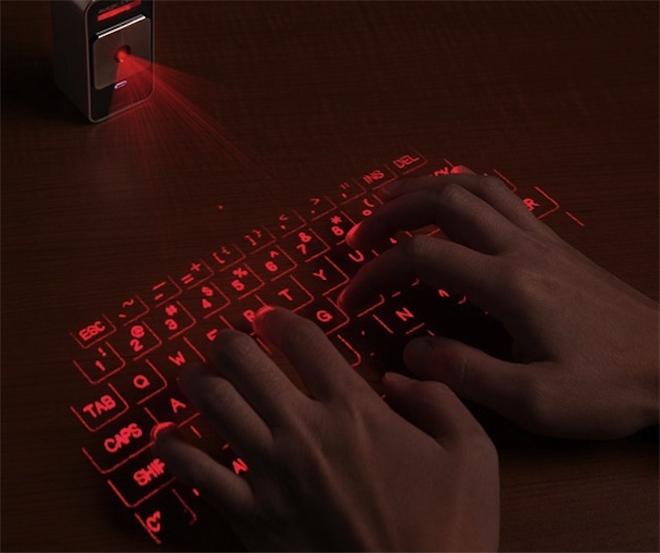 The Magic Cube laser-projects a virtual, full-size, 63-key keyboard onto just about any flat and opaque surface. You tap on the table in front of you, and the Magic Cube’s magic eye translates your virtual keystrokes into real keystrokes. The device itself is tiny, but it ostensibly makes typing easier than on the tiny keyboards on mobile devices. And it works on a wide range of mobiles. It connects via Bluetooth to iPhones (3GS or later), iPads, Android 2.0 phones, and Blackberry tablets. You can also connect the cube to a Windows or Mac computer using USB. Celluon says the projection keyboard handles input speeds greater than 50 words per minute. That’s theoretically, because the “Projection Keyboard Perception Chipset” within tracks finger movements optically (if not optimally) instead of the physically activated switches of a regular keyboard. In a series of tests with an iPad, iPhone and a Gateway notebook, the Magic Cube proved less than magical when it worked at all. The sentence at the beginning of this review represents the best the Magic Cube could deliver when I typed at full speed. On many tries, the keyboard would start typing random characters without any human input. Or, it would switch to all caps when my hands were nowhere near the caps lock key. Since typing on a flat surface provides no touch feedback, the Magic Cube uses an audible click for each tap. Welcomed at the start, the clicks soon became annoying. Their volume can only be adjusted using a Function-key combo. Yeah, just try to tap two keys at once on a projection keyboard. It is about as effective as a Band-Aid on a coronary. While the tiny device is lightweight and portable, its battery life is listed as 2.5 hours. Type on a flat surface for even an hour and aspirin will be mighty tempting. But even if you are a trooper, 2.5 hours of power doesn’t cut it when you aren’t near a recharge. The Magic Cube sadly is like the surfaces it lets you type on — flat. WIRED Tiny and battery powered. Laser projection brings a full-sized keyboard to portable devices. Can be set up on any flat, opaque surface. TIRED Touch typist? Forget about it. Accuracy goes out the window. Short battery life.